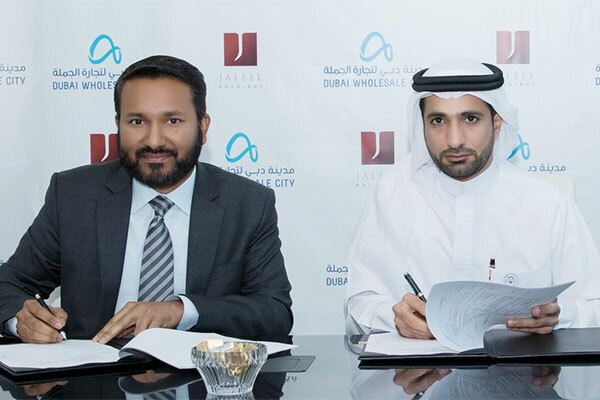 Jaleel Holdings, one of the UAE’s largest fast moving consumer goods (FMCG) wholesalers, will construct a cash-and-carry facility within the Dubai Wholesale City (DWSC), the region’s largest fully integrated wholesale hub, at an investment of Dh100 million ($27.2 million). Spanning an area of 300,000 sq ft, the premises will include a fully integrated state-of-the-art direct sale warehouse accommodating more than 250 employees, as well as a flagship store, storage and cooling facilities and manpower accommodation in the DWSC labour villages, it stated. The agreement was signed on the sidelines of DWSC’s participation in Gulfood 2018, in the presence of Abdulla Belhoul, the chief executive of Dubai Wholesale City, Saud Abu Al Shawareb, the chief operating officer of Dubai Industrial Park, Sameer Mohammad, the managing director of Jaleel Holdings, and other senior management officials. Welcoming Jaleel Holdings to Dubai Wholesale City, Belhoul said: "The wholesale hub offers comprehensive, modern and well-integrated infrastructure and facilities that optimizes the production and distribution of products." "We remain committed to accelerating the development of the trade and manufacturing sectors in Dubai and the wider UAE, and helping our business partners build and grow their businesses," he stated. "We are confident that their new facility will benefit from DWSC’s strategic location and superior infrastructure to enhance their position in the market and contribute to their growth story," he added. On the partnership, Sameer Mohammed said the new facility will help the company to expand regional presence and strengthen its status as a pioneer in food trading. "Today, especially in light of the strong competition in the UAE market, every entity is keen to achieve excellence and efficiency in production, distribution, and transportation in order to keep up with the development goals and targets of the country. In this regard, a fully-integrated destination such as Dubai Wholesale City supports the aspirations of business operators and investors with its offering of smart solutions and superior infrastructure," noted Mohammed.